Why would your age turn me off of helping? I ain't exactly young. my email is skimblzbvs at yahoo dot com. That's the email I use for this stuff. If you got the haynes manual, I think that is the right one. I have the factory service manual for your year as well, but those kinds of repairs are probably more than you need to worry about. I can help ya as much as possible. When you contact me, I have a few things you can try. I'm hoping the manual will be here by tomorrow. I'll let you know. Thank you for your email address. I'll send you an email so you have mine as well. I've read way to much about the Deat Wobble the past couple of days. This is my first Jeep. It's a 2007 Wrangler Unlimited Sahara. I haven't done a single thing (alteration wise) to it since I bought it brand new from the dealer. I've had it since Jan. 07 and the "wobble" has started. Of course, I'm still under warranty and the dealer has ordered me a new damper to "repair" the problem. I'm only 8K miles away from the warranty expiring so I want to make sure everything is taken care of. What do you suggest I do if the damper will only mask the problem for a short while? I had this problem after only 13,000 miles on my 2003. Jeep service said the steering damper was bad and I replaced it. Although this helped, the problem was still there. I went to buy new tires since they always seemed like they were out of balance but asked the tire dealer to check the track bar first. Quite a few people have commented on this site about it being the problem. The dealer found a small amount of movement in the track bar which shouldn't be there, replaced it, and the car drives like a new one. It doesn't shimmy, the car now feels solid, and so far the wobble has not returned. I suggest having this checked which is easy to do for a technician. The dealer did tell me that there is a new steering damper out for the 2003 which was over double the price of the original which makes me suspect it might have caused the track bar wear. Anyway, good luck in finding the problem. Jim, Thanks for the input. I'm taking the Jeep in tomorrow to check out the track bar. It isn't just the track bar you should check out. Any joints or steering components should be considered. 1. Control arm bushings - if they are worn, you may get play in the axle. 2. Tie rod ends - ensure greased, intact, and no lateral movement (may have some rotation due to the joint type). 4. CV joints - jack tire up and check for motion top to bottom /\ kinda thing. 5. Draglink/tie rod. make sure that connection is secure as well. If the problem has cropped up, you should also ensure your tires are properly balanced and have even wear. IF you replace the steering stabilizer/dampener, I'd suggest at least getting a good aftermarket one, like Old Man Emu or something. That stock unit is so so. That will be my next acquisition. As an FYI, I'm on 33" tires with NO death wobble at all. Aftermarket track bar (JKS), and a Grand Cherokee tie rod (stronger). I did swap out my control arms back in August to newer, unbent ones. I did notice my trackbar loose at one point, but the only issue I had from it was loose/sloppy steering. If you look at this pic, you can see the primary components for the front suspension. Any of those points being loose can create havoc. What is this death wobble your are refering to? 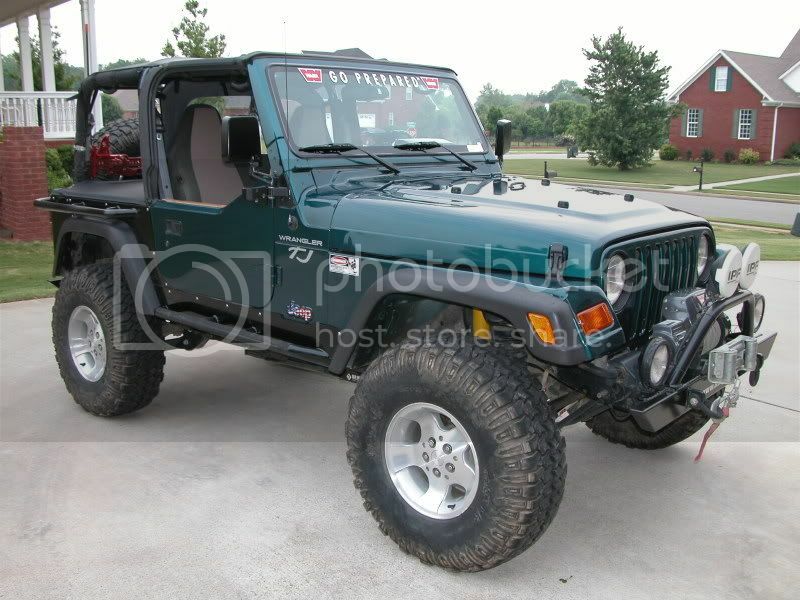 I have a 98 Jeep and i think I might have it. It wobbles violently every once in a while when going 40-50 mph until I reduce speed to about 20mph. There is no indication when it is going to happen. Also, I just bought rims off an '08 Jeep X Unlimited and I want to make sure that the bolt pattern on the new jeeps are 5 x 5. I want to get the right wheel adapters to make them fit on my '98. I just bought 17" rims with Goodyear Wrangler 255/17R tires. will they fit under my 98 Jeep with out a lift? 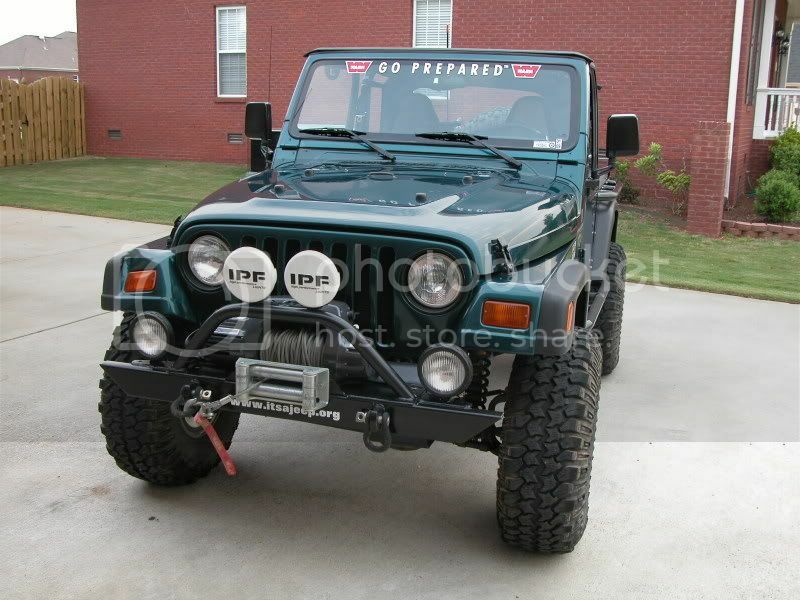 I know I will have to get wheel adapters for the 5X5 bolt pattern but I am afraid it will rub the flares. Not certain, but the larger wheels should clear the brake calipers and such. I haven't tried it, so no clue as to whether it will clear. You may have issues with turning but I don't know the backspacing on the new wheels. With wheel spacers, you should be okay. Just do NOT use the shim kind of adapters. SpiderTrax is all I'd really recommend. And it sounds like you have Death Wobble too. I'd fix THAT before changing your wheel configuration. It's an uncontrollable shaking of the whole vehicle which originates from the front end. You are unable to stop the vehicle from changing lanes and you'll invariably end up in the median or the ditch (or even the E.R. :surprise: ). It's scary, your life flashes before your eyes, and it carries a very real threat of an accident, hence the term 'death wobble'. It's not just a bad vibration or shake, and accelerating, braking, or decelerating won't make it go away. Thankfully it's also very rare, though it happens enough to be a recognized phenomenon, and most commonly occurs in Wranglers and Dodge Rams. If you were to experience it or observe it happen to another vehicle I doubt you'd ever forget it! but i would spend the 300 dollars and replace the front bearings a front stabilizer shock wont help you it is for off road and to keep the stering from breaking your arm when you put the front tire in a bind or hit something. I have an appointment with Domonick at Xtreme Jeeps in Tampa (FL) next Monday. I checked with the dealership and found out my Jeep was put in service on April 25, 06, so I'm hoping if anything the warranty covers, I can get it now without having to shell out big bucks now or later. my jeep has a 3.5 lift and it drives great on and off road i run 33-12-50 and bf goodrich are good tires on and off road and my lift was 2500 dollars but you could find one for 1000 or so. it depends what you want to do with the jeep if your going for looks,trail riding a cheep one will do but if you are going rock crawling you need a good lift. You may want to at least qualify that. The 31's are not a problem. The 12.5" width MAY be a problem. If they are stock wheels, backspacing is likely 5.5" and they WILL rub while turning. Adjusting the steering stops a bit will help, but ideally wheel spacers or new wheels with a lower backspacing would be implemented. I have a 2008 4door jeep wrangler jk unlimited. I take her offroading all the time. I have size 265X75Xr16 mudding tires on it now. I am planning on getting a 4" to 6" lift kit on it in the next month or so. My questions is Will i need to buy new rims/wheels for it to put 33" tires on it. I belive that the 16" rims it came with are to skinny, any help? Also I was told that if i put anything bigger than 33"s on it I will loose alot of horsepower and have more breakage. Is this true? You can wheel with the same tires, but honestly it is going to look really stupid with a 4" to 6" lift and stock tires. Think of a roller skate. 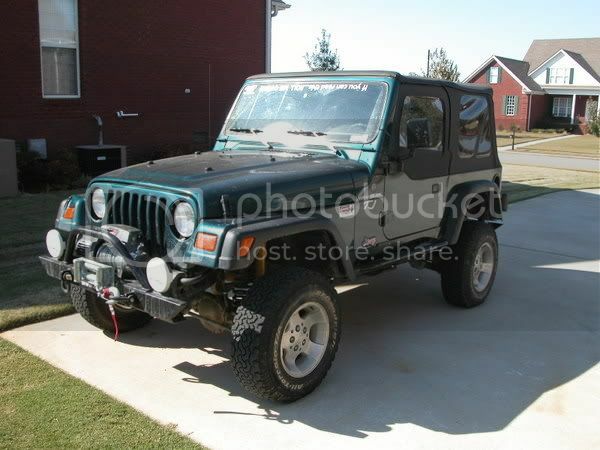 Here's a pic of my TJ with just a 3" lift and 1" BL running stock 30's. Imagine a bigger lift with yours. The lift really isn't going to help you a whole lot if you are keeping the same size tires. Your low point will still be the axles. Offroad, you'll still get good articulation with a decent 4-6" lift, but again, your tires will still come in to play. However, if you want to go to 33's you'd be MUCH better off. My wheel is an 8: wheel, but I now have 33x12.5" Mud Terrains on it. A skinny wheel is not necessarily bad for offroad. It provides a good lip for the wider tire. Here's how mine is now. Now keep in mind, if you air down your tires for offroad, you don't want to air down TOO much or you'll lose the bead. Airing down is good for better traction, AND it will help keep branches, sharp rocks, etc from puncturing a piece of rubber at full inflation. You DO lose some height doing this, but the traction gain is well worth it. Pretty much any reputable online 4x4 shop will have em. Go with a decent maker like Advanced Adapters. 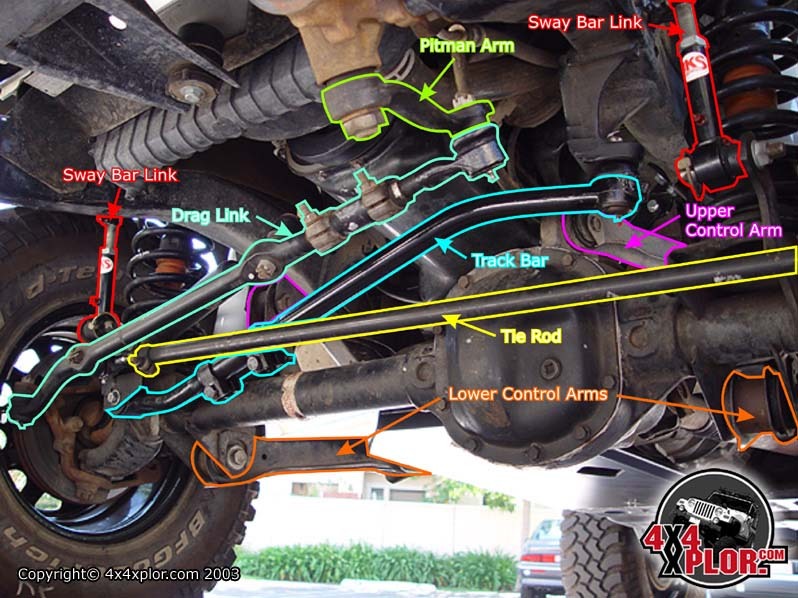 You will likely also need to get at LEAST adjustable rear upper control arms to rotate the rear pinion up a bit bit to more appropriately line up the angle with the driveshaft. There are lots of writeups online about SYE (slip yoke eliminator) setups. I have a 2008 jeep wrangler x I have not done anything to it. I was wondering what size tires and wheels I can put on it with out haveing to lift it? I have an 06 Sport with, yuck, hubcaps! I wanted to get new rims and tires and wanted a second opinion if they will really fit. I don't go off road but do a lot of highway driving so I'm not going taller. 3.68" BS seems kinda high for a tire of that dimension if I'm reading it right. I have 33x12.5" and have 4.25" and would prefer to be at 4". In case you didn't know, the higher the BS number, the more 'tucked in' a wheel will be. So a 5.5" BS wheel will be tucked nicely (stock wheel) whereas a 3.75" BS wheel will stick out a bit more. Not advising against it, just advising on what you can possibly expect. I've been so concerned about the tires rubbing I didn't think about how far they would stick out. Guess I'll look around for something with a little more backspacing. More backspacing = lower number. Less backspacing = higher number. If you go with something about 3.75-4" you should be good, even if you go up in tire size a bit. 3.68 just seems a bit odd to me. Here's 4.25" of backspacing with 33x12.5" tires. 3.68 would stick out about a half inch more, but keep in mind my tires are 12.5" wide (wheels are only 8" wide). Seems like everywhere I look the backspacing is somewhere between 3.25 and 3.75. I guess I'll just suffer through wet elbows when ever I run through a puddle with my arm out the window. Even though I think I've seen them all, can you recommend a web site for rims? I've been trying to get a 15x7 or 15x8 in a black gloss finish. WAY too many to specifically mention any in particular. You looking for alloy or steel? I've narrowed my choice of rims down to a couple. They're gonna have to stick out a bit but I can always get bigger fender flares if it's a problem. Now I have a bit of confusion on tires. As I understand it, 31's will fit without a lift or modifying the fenders, but it sure seems close to the top of the current plastic fender flare. Will I have any problems with them rubbing going over bumps? Also, with either 30 or 31 inch tires, what issues will I have with the spare? Am I looking at buying 5 tires either way I go? 30 or 31's won't be a problem with stock suspension/height. If 31's look closed, you may have older springs and they are sagging a bit. 30/31's will fit the stock tire carrier w/o issue. 32's and 33's may be a problem width/height wise if you are on stock wheels. An aftermarket tire carrier would likely be your safest bet in protecting your tailgate.